Students crowd around three tables outside the mock courtroom at Charlotte School of Law for a recent Saturday friendly poker game against Elon University. Onlookers can’t tell from the T-shirts and jeans worn by the nearly 30 students and teachers gathered at the school, but poker isn’t the only high-stakes game being taught within these walls. The gathering was sparked by CharLaw professor John Kunich, an avid poker player (he’s made his way deep into the World Series of Poker twice in the last three years) who came to the affair dressed to the nines. Kunich’s “Stan Laurel” getup is a trademark of his poker circuit matches– he uses the “nutty professor”act as a feint. In the past year, Kunich has found a way to blend his love of the law with his passion for the gentleman’s game. His inspiration came from one of Kunich’s former professors– Harvard Law School’s Charles Nesson, one of the founders of the Global Poker Strategic Thinking Society. tips from the pro circuit. One of the key tenets of the ideology is using what you know to get the upper hand Kunich said most lawyers are aware of their own facts and witnesses, but that isn’t enough. You also must understand what “cards” your opponent holds. 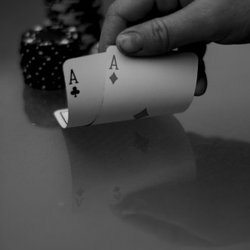 “A good poker player, like a good lawyer, thinks about what the other side might have and why they are still in (the game). You figure out if you have the advantage or not,” he explained. “That’s taking it to the next level, and a lot of people never get beyond that in law or in poker. So they lose. The strategy also involves carefully planning your next move. The blunders, Kunich said, come from losing emotional control (“going tilt” in poker parlance) or relying too much on bluffing. Both can tarnish one’s reputation in the courtroom or at the table, so focus and maturity are important attributes for the students to master. In the broader spectrum, Hart continued, lawyers have to learn to choose cases based on what they wager will come before a judge. “It’s a lot like when you play (cards); you watch how many are folding and who’s still in the hand,” he said. “It’d be one thing if (students) just had a poker club playing cash games every week, but with this we have a chance to play some Ivy League schools,” Kunich said. “We can’t compete with the prestige level of our faculty or how long we’ve been in existence, but we can compete on this level.